The two touch dribble is a timeless classic. 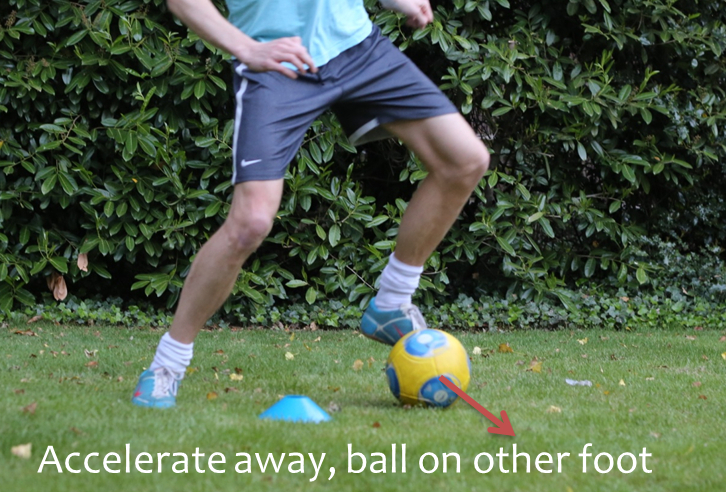 By shifting the ball quickly from one foot to the other, you can unbalance defenders and skip past them on the 5-a-side pitch. It’s one of the simplest yet most effective moves and is one that should be in your repertoire. You can start on either foot but we’re going to start on the right for the purpose of our illustration, so have it just in front of your foot on the right side of your body. If the defender is approaching you then it’s time to brace yourself for a two touch dribble. It helps if this move is performed with some speed, although it is more important that it is done in a controlled way so that it sets you up nicely for step 3. It’s important that this touch is a tap forwards, not a tap sideways back the way the ball came, otherwise you’re not going anywhere but side to side. When the ball is knocked forward, you’ll need a quick burst of pace to get away from your opponent and make sure that you don’t give them the chance to recover. If you get past them, consider cutting back across them so that they can’t get a tackle in without fouling you. 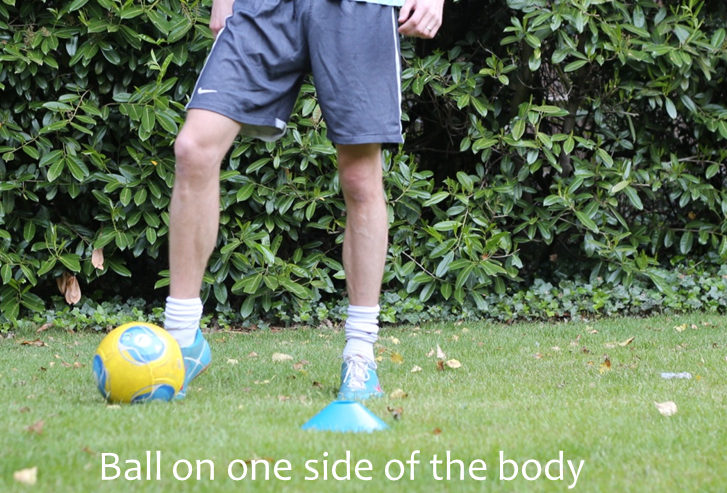 Before you touch the ball across your body, can you unbalance the defender by feinting to go the other way (i.e. if you’re starting on your right foot, look to your right or fake a pass to that side before two-touch dribbling off to the left)? The larger the distance you can flick the ball from one foot to the other, the more difficult it will be for the defender to tackle you. 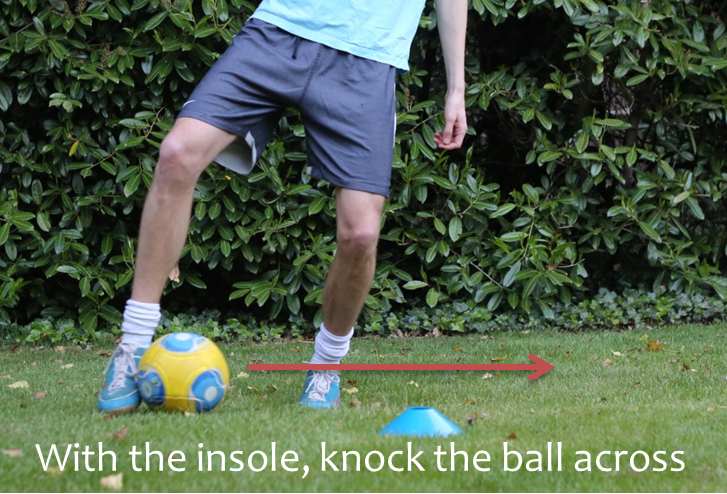 Instead of just knocking the ball straight from one foot to the other, if you can slightly knock the ball backwards at the same time before pushing it forward with your second touch then this will give you a little extra clearance around the defender’s tackling leg. The undisputed king of the two touch dribble was Michael Laudrup, the Danish legend. The first minute of the following video shows several of the best examples of this technique that we’ve ever seen, followed by another minute of perfect examples starting around the 2:45 mark. Laudrup made this move his trademark in what was a glittering career. He’s arguably one of the greatest players to play the game, and watching his highlight reel you see that a large part of it was built on the two-touch dribble. Today Messi is probably the best user of this technique, although he uses an array of other moves too, but in our view there aren’t any players doing it quite as well as Laudrup ever did. Enjoy! (PS. If you enjoy watching this then consider watching a documentary of his full career, which we’ve reviewed here). You forgot iniesta as one of the best current players who uses this move. He grew up watching laudrup and was a big fan. Great comment, Chris. Yes, never made that connection myself, but it makes a lot if sense. Cheers! What about his passes with the outside of his foot? It’s a crying shame we don’t see more of that technique! I agree! Any chance of a YouTube video demonstration? There might well be Brian, there might well be. I’ll see what I can sort out. Not sure I’ve got all the technology for it, but I’ll see. Thanks for the comment. Laudrup is pure poetry in motion. A lovely little execution of something similar to the ‘hip fake’ that you mentioned in a previous post at around 01:08 as well. The reaction of the defender says it all! He rarely seems to do anything too complicated, I guess there’s no need to when you can do the simple things like this so well! Glad you liked – he really was a different class. There’s so much that the average player can pick up just from that video! Plenty of different techniques on show but he just keeps coming back to the two-touch dribble. I’ve said it before, but he’d be one of the first on the teamsheet if I was putting together my fantasy football 5-a-side team.